A personal ritual that you may want to include in your wedding ceremony is the sand ceremony. 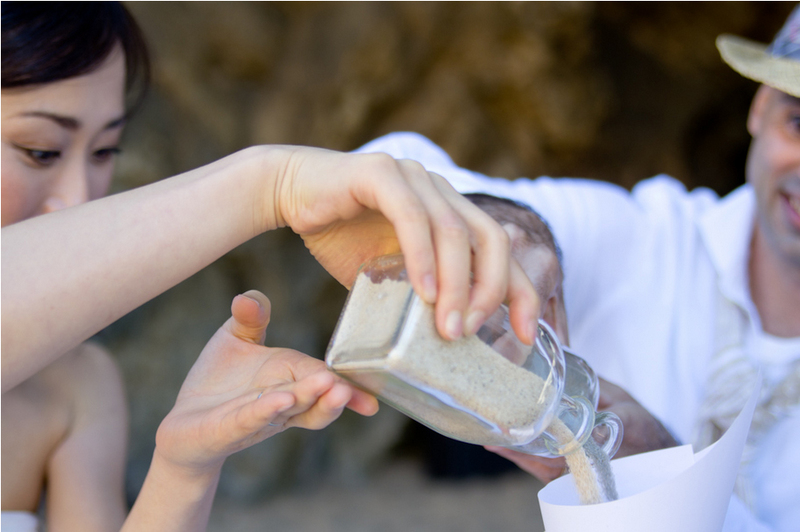 After bride and groom have given each other their promises the celebrant invites them to pour sand from two bottles in one bottle, to symbolize the joining of lives that are now inseparable as the grains of the sand. You can choose the colours for the sand or simply opt for darker and lighter coloured sand. The bottle with the sand that was poured will be a keep sake that you can take home with you. It can easily be transported as it is sealed with a cork. Please tell your wedding planer you wish to include this into your wedding ceremony or if you wish to send you the sand ritual kit by post please contact us to order. We need to know the colours of sand and colour for funnel. The postage costs are 5 € inside Portugal. Please contact us for postage to other countries.